I bought a lot of tomatoes at the greenmarket this week. I mean 10 lbs a lot. In my defense, they were super cheap, plus I planned on making some salsas and caprese anyway. Unfortunately, when I decided to half the salsa recipe, I forgot to half the tomato quantity, so I ended up with some extra. No big deal. I had basil and garlic left over from my Tribeca CSA share so I just made some bruschetta with it. Then somehow I ended up with about a quart of bruschetta. Hmm…a whole quart. Back when I lived in Philly, there was a restaurant I visited once or twice on South Street called Next. I thought they had pretty good food, but apparently there were kitchen changes which eventually effected the quality, forcing them to close all too soon. I remember having a simple but delicious dish there: a pounded thin breaded pork chop served with bruschetta. When I first saw it on the menu, I thought what a strange combination! But I’m not one to back down from something new so I went for it. It was just perfect. The juicy pork flavor, ripe tomatoes, tangy garlic. It was love at first bite. Yet as delicious as the dish was and as much as I wanted it again and again, something distracted me. Life got in the way, I moved to Brooklyn and didn’t think about the dish again for 6 years, until I was in my kitchen, confronted with a quart of bruschetta. I had the bruschetta, it was only the pork I was missing. I headed out to buy some pork cutlets, a perfect exuse to finally visit to Fleishers Meats in Park Slope, Brooklyn. Visiting Fleisher’s, however, might have been a mistake. I see a very expensive meat addiction growing. The store was beautiful. Possibly every cut of beef, chicken and pork I could imagine, all with the assurance of sustainably and pasture raised. Plus there were house made sausages and hot dogs (even mini cocktail weenies! ), a refrigerated case of cheese and far too many other tasty Brooklyn products for me to comprehend. I quickly ordered and purchased my pork and dashed out before I could do any severe damage to my wallet. At home I prepared my pork cutlets. First dipping them in a mix of egg and milk, them coating them with breadcrumbs. On a nonstick skillet drizzled with olive oil, I cooked them on high heat until browned on both sides. The cutlets were super thin, so only about 2 minutes on each side, so as not to dry them out. I plated the cutlets and poured a generous amount of bruschetta over them. 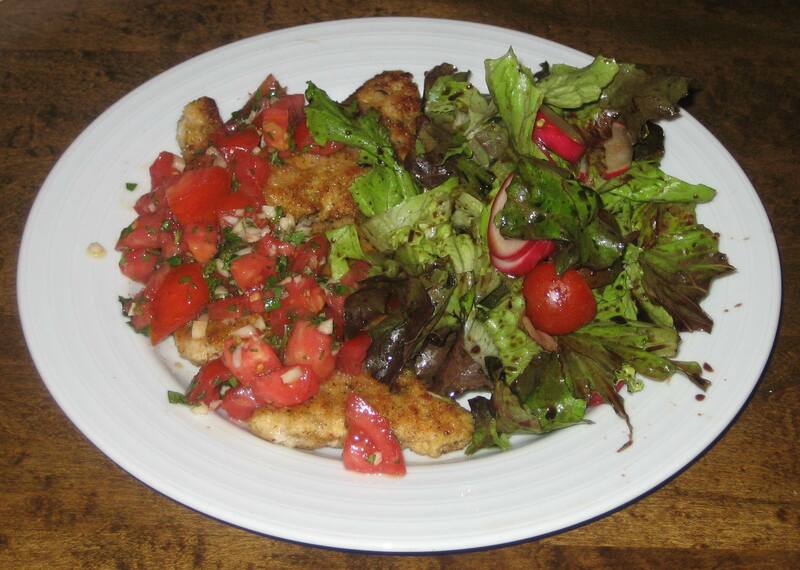 Then served with a simple salad of greens, radishes and cherry tomatoes. Minus the time it took to make the bruschetta and maybe wash the lettuce, the whole meal took about 10 minutes–and maybe even less time to devour. Mix tomatoes, garlic and basil in a medium bowl. Add olive oil, adjusting to desired “oiliness”. Mix all ingredients well. Season with salt to taste. Cover and refrigerate for several hours (or better, overnight) so flavors blend. Serve on toasted baguette slices (or over breaded pork cutlets! ).